Errol: For those of you who were on twitter or facebook yesterday, we were posting like fiends! 😀 Lots of fun times were had at the CNE. We talked to a bunch of the people there and they were very polite to us after having to listen to our voices for two weeks straight. They were geeky too, so that was awesome! Thanks CNE Crew! You were awesome! After all of the searching for comic titles you made us do, you can’t be bothered to see if there’s already one titled “Two Weeks”? Okay, so let me get this straight–at this fair, someone else put up a display for you guys? So that’s how the fair works? Anyone can just set up a display for whatever they want? The closest thing we have around here (not speaking for all of the US, just my area) is the industrial tent at the annual street fair. Logan businesses and other enterprises (political parties, churches, etc.) set up a table and show off what they have to offer, advertising and often having some sort of prize drawing. Normally, the CNE has exhibitor booths for local businesses to sell stuff. These are normally… normal exhibits, as you can see from the other exhibits there. However, they had this one exhibit about fandom. 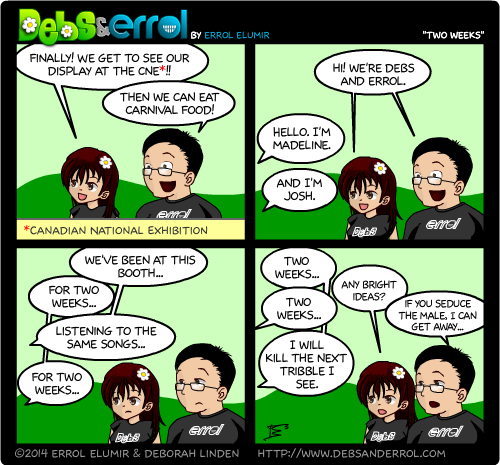 The event coordinator, who works for the CNE, did a google search on geeky things and found us.